Can graphene be used to kill cancer cells? 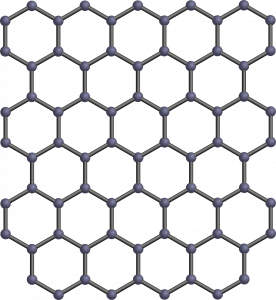 Graphene is one of the big discoveries of the last decades. It is a 2-dimensional carbon material and can be considered as a huge conjugated aromatic system (Figure 1). It attracted a great amount of attention due to the new properties that are shown: high conductivity (heat and electricity), strength and diamagnetism. 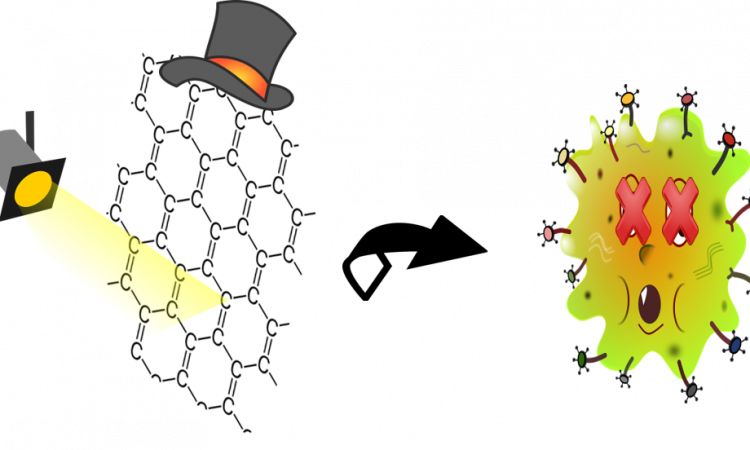 The use of graphene nanostructures (nanographene) in bioimaging and biosensing is widely explored thanks to their very intense fluorescence emission. But the 2D structure makes it difficult to disperse them in solution. The authors of this paper synthesized, with a bottom-up approach, nanographene that is soluble in organic and aqueous solvents, protic and aprotic media. It has an intrinsic 3D curvature that shows a whole new range of interesting properties and is thought to be the next-generation carbon material. For example, the 3D curvature avoids the stacking and the aggregation of nanographene molecules in solution by decreasing the entity of π-π interaction. This increases the solubility in organic solvents. Moreover, during the synthesis, tetra(ethylene glycol) chains are added in order to also promote also water-solubility (TEG-3D-nanographene). Thanks to its water solubility, its amphiphilicity (with hydrophobic and hydrophilic character), and its small size it can penetrate the cell membrane. Its UV-Vis absorption and fluorescence emission were characterized: the absorption of TEG-3D-nanographene in different solvents (H2O and CH2Cl2) show similar behavior with maxima around 430 nm, with a big shift in the fluorescence spectra. Exploiting the water solubility and the fluorescence of TEG-3D-nanographene, the authors of the paper used it to stain (color) HeLa cells (human cell line, commonly used in scientific research, originally from a cervix cancer). They demonstrated, first of all, that, in absence of irradiation, the cell viability stayed unchanged, showing no direct or immediate effect of TEG-3D-nanographene on the cell line, and irradiating at 489 nm without TEG-3D-nanographene did not show any changes again. On the other side, selective irradiation at 489 nm rapidly killed the HeLa cells in presence of TEG-3D-nanographene. This cytotoxic effect was demonstrated to be concentration dependent, killing almost all the cell line with only 5.0 µM of the nanostructure. The mechanism that leads to cellular death is still unclear but it is known to involve singlet oxygen generation and free radicals (very reactive species, often cause of tissue-damaging and degradation). This new application can lead the way for a new type of photodrugs based on nanographene structures. The tunability of these structures makes them interesting and exciting for the new range of possible applications. Looking at this specific case, its low cytotoxicity in absence of irradiation makes it a selective killer, activable and thus controllable from the outside. 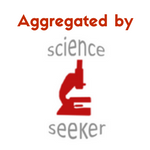 Although it is not cell-selective per se, the irradiation can be turned on only in presence of the target cell.